Pre-order links are starting to trickle in - see below. Update 15/04/19 : The console will come with a 1TB hard drive, with pre-installed copies of Minecraft, Sea of Thieves, and Forza Horizon 3. Bundles are expected to come in at around the 230 Euro mark - expect similar in UK markets at £230ish price point, rarely see conversion like for like but we can hope. 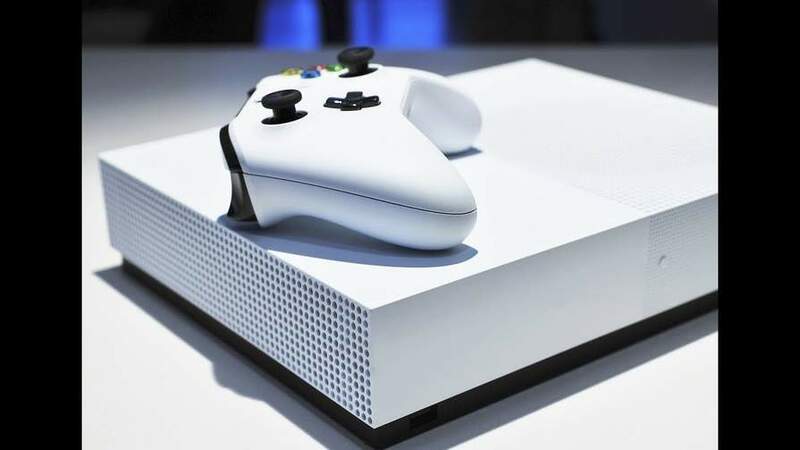 There's strong rumours across the WWW that Microsoft are set to launch an ALL DIGITAL Xbox One S in April this year, with the consoles being shipped in the first half of May 2019. I'm all for new consoles but i'm not sure i quite get them, Microsoft, launching ANOTHER Xbox One S without a disc-drive. Yes, it's great for digital-only users but unless it's more powerful and/or cheaper than the current prices of a Xbox One S atm, with a disc-drive, will it struggle? Especially with a lack of a 4K drive for other media. Prices are also usually much higher elsewhere on digital stores, that goes for all publishers like PlayStation & Nintendo. Yes the Xbox Pass is good value for money, that's coming from a PlayStation fan myself, maybe you'll get a 6/12 month sub with a new bundle. Now and again we have Xbox digital sales also, maybe they'll offer even deeper discounts? Would you be interested in an all-digital Xbox hardware? if so what price would you be willing to bite at? Don't understand digital only, you throw away so much money compared to physical. I never understood why gamers spend (often more) for digital copies which have no resale value. Why do they sell digital games at the same or higher price compared to physical copies? What is the rational? Surely the companies are saving a lot by avoiding storage, shipping, manufacturing costs so why is this not passed to the consumer? Disagree, I use foreign stores to save money, and I like to keep games so …Disagree, I use foreign stores to save money, and I like to keep games so don’t sell them on. Had PS4 rdr2 for £33 on launch day and was playing it 6 hours before everyone else. If MS and Sony go digital only there is every chance they will close the foreign store loop holes. You can never rely on a work round. Would you feel so keen if the UK store was you only option and it was £60 on launch day? I'm all for a digital only Xbox One S, I only own one game on disc but I currently have an Xbox One S & wouldn't have any reason to buy a new one. If this is true, the timing just seems off, I think they're bringing it out a little too late. What they need to do is make digital like physical. So you buy the code from any retailer, you can then resell that code on to someone else when you are done. But its against MS interest as it means they lose sales. Don't understand digital only, you throw away so much money compared to …Don't understand digital only, you throw away so much money compared to physical. Disagree, I use foreign stores to save money, and I like to keep games so don’t sell them on. Had PS4 rdr2 for £33 on launch day and was playing it 6 hours before everyone else. $200 according to someone in another thread. Don’t see any appeal at that price. You can pick up a normal S with some games for about that. Even if you are a digital only person having a disc drive makes the machine far more versatile. Digital only is the best way to go in the future. I hate disks. Always only get digital games only now on all 3 consoles. One major advantage I see of owning digital also is that hopefully the future consoles will be backwards compatible and I will have all my xbx1 and PS4 games on my account that can just be played on the new consoles. All the people with discs won’t be able to do that unless of course they add in disc drives to future consoles. This is what Microsofts vision was at the release of the xbox one but it worked against them. The market for gamers is a strange one and can't be dictated to, you must listen to them and give them what they want. What they need to do is make digital like physical. So you buy the code …What they need to do is make digital like physical. So you buy the code from any retailer, you can then resell that code on to someone else when you are done. But its against MS interest as it means they lose sales. Like the idea but can never see them doing this, unless you'll buy digital and then once finished that said game, MS give a % back via the store, like a trade-in type deal? I think the goal here is to turn gaming in to a Netflix style service... which is great if you ask me - if this becomes the norm in future we wouldn't be looking at £60 release day games at all. Just new games added to our subscription, which as it stands is very reasonably priced. It's a shame this can't happen sooner, but I think consumers and developers need time to get used to the idea. It works quite well for a Game Pass sub. I'd probably buy digital new releases if these were cheaper (25% say) than physical copy. Given the choice I'd still rather have a device capable of playing physical media games - even if I rarely used the functionality. Digital download costs for than physical copies in both Xbox store and playstation store unless you purchase from 3rd party like cdkeys. For it to be a winner full 4k for gaming and video playback, larger hard drive, 2 controllers, digital downloads cheaper, console cheaper. If MS and Sony go digital only there is every chance they will close the …If MS and Sony go digital only there is every chance they will close the foreign store loop holes. You can never rely on a work round. Would you feel so keen if the UK store was you only option and it was £60 on launch day? If they go digital only they won’t have that pricing model. That’s forced on them by the retail store network who don’t want to be undercut which is why digital store prices on switch, Xbox and PS4 have always been so high, with the exception of sales. Cant see them closing the loophole because they still get a lot more money than they do paying retailer margins and distribution costs, and they’re not losing sales to second hand market. They know it’s there but it’s a minority that use it. My imac hasnt had a cd/dvd/bluray drive in it for years and years, nor my windows PC, and ive had no problem consuming top quality content at a good price point. I think the goal here is to turn gaming in to a Netflix style service... …I think the goal here is to turn gaming in to a Netflix style service... which is great if you ask me - if this becomes the norm in future we wouldn't be looking at £60 release day games at all. Just new games added to our subscription, which as it stands is very reasonably priced.It's a shame this can't happen sooner, but I think consumers and developers need time to get used to the idea.Anyone buy DVD's anymore? However I also rent games through boomerang for the single player games and games I want to try - I brought a PS4 Pro and played all the exclusives by renting and then returned them. Far cry new dawn and metro exodus I played, completed and returned. If the disk drive wasn't an option I just wouldn't play as many games - I want to try games and without demos boomerang is a viable alternative for the moment but it will be a sad day when the disk drive is finally removed. I do like digital games. There has been many a night after a hard days work I sit down to play some Xbox but the game I want to play is not in the drive. Alot of the time I just end up playing a different game as I don't want to get up to put the disc in. Still do like being able to grab a deal on a game in-store. Given the chose I think I would spend a bit more to get a console with a drive in it. Not really the same thing as there are practically no barriers to the TV & movie companies creating their own apps on hundreds if not thousands of different hardware platforms and supplying their content through it themselves, Netflix have zero control over it. Whereas Sony and Microsoft (and to a smaller degree Nintendo) have the console market locked down so tight with their own hardware and operating systems that the game devs/publishers aren't free to do anything like that without their permission. If they go digital only they won’t have that pricing model. That’s forced o …If they go digital only they won’t have that pricing model. That’s forced on them by the retail store network who don’t want to be undercut which is why digital store prices on switch, Xbox and PS4 have always been so high, with the exception of sales. Cant see them closing the loophole because they still get a lot more money than they do paying retailer margins and distribution costs, and they’re not losing sales to second hand market. They know it’s there but it’s a minority that use it.My imac hasnt had a cd/dvd/bluray drive in it for years and years, nor my windows PC, and ive had no problem consuming top quality content at a good price point. There is only chance a digital only captive market in console terms sees to a reducing of price. How digital PC games work is a different beast. None of the three will allow different software shops on their consoles and that’s the only way price would drop. Not really the same thing as there are practically no barriers to the TV & …Not really the same thing as there are practically no barriers to the TV & movie companies creating their own apps on hundreds if not thousands of different hardware platforms and supplying their content through it themselves, Netflix have zero control over it. Whereas Sony and Microsoft (and to a smaller degree Nintendo) have the console market locked down so tight with their own hardware and operating systems that the game devs/publishers aren't free to do anything like that without their permission. We’ll have to agree to disagree, there can be digital distribution platforms that can increase the size of their net base - just look at steam and steam sales for example, without being beholden to the retail network, digital software does not have to cost so much. It’s similar to apple and esims, they were trying to bring them in for years but carriers resisted because they wanted to lock customers in. As technology changes, so does people’s buying habits. Few years ago everyone bought contracts with SMS and minutes, yet in the last 12 months I’ve sent about 20 SMS and make very few phone calls. The focus now is data allowance as messaging platforms evolve. go back in time 10 years and people are renting dvds and doing mail in / out services to loan them from love film etc - now no-one operates that model and no one seems worse off for it. Ha. I wish I believed that Sony Nintendo and MS were FORCED to over charge …Ha. I wish I believed that Sony Nintendo and MS were FORCED to over charge by Game and GameStop...There is only chance a digital only captive market in console terms sees to a reducing of price. How digital PC games work is a different beast. None of the three will allow different software shops on their consoles and that’s the only way price would drop. all 3 have to consider what their competitors are doing at all times. Look at the storm that hit MS at Xbox one launch when they were introducing loads of drm controls & online checks...easy win for Sony and they were forced to backtrack. The market will bear certain prices, above that there’s risk. I don't think you've lost touch with reality but perhaps you're not old enough to remember games costing £60 in the 90's. I still remember MegaDrive and SNES games costing that much. More recently, N64 games came out at that sort of price too. It's nothing new and, if anything, with inflation they should cost more. It's not 'our right' to have cheap games; don't forget the thousands of hours that developers put into these games. I don't think you've lost touch with reality but perhaps you're not old …I don't think you've lost touch with reality but perhaps you're not old enough to remember games costing £60 in the 90's. I still remember MegaDrive and SNES games costing that much. More recently, N64 games came out at that sort of price too. It's nothing new and, if anything, with inflation they should cost more.It's not 'our right' to have cheap games; don't forget the thousands of hours that developers put into these games. Don't see it being a massive success to be honest. Unless the price of digital drops I just don't see the appeal, unless you're stupid enough to spend £60 on a game that's been over-hyped and then proves to be a dud. Digital only also ensures that MS control all pricing, thereby monopolising the market. Look at AAA titles - MS will still charge £60 for something when Smyths or Game drop it to £25 for the disc 3 months later. Let's not forget also that a lot of people use their One as a blu-ray player. And for those who respond with "Netflix" etc. blu-ray will always be better than a digital copy, both in terms of picture and sound quality. Digital only is not good for the consumer or retailer, ultimately it puts all the control back with the service provider. They know as a business model it generates a lot more money. Other posters are right, consumers will end up with various subs spending more money. Same will happen with Netflix, as copyright owners launch their own services they will stop letting Netflix have access / early access. But what if you'd shelled out £33 (or more) for RDR2, hated it (as I did) and couldn't trade in because it's a digital copy?? £33 down the toilet whereas I could walk into CEX and get £33 back in my pocket. But what if you'd shelled out £33 (or more) for RDR2, hated it (as I did) …But what if you'd shelled out £33 (or more) for RDR2, hated it (as I did) and couldn't trade in because it's a digital copy?? £33 down the toilet whereas I could walk into CEX and get £33 back in my pocket. I don’t buy games I am not confident about. I never pre-order games because it’s a mugs game and I enjoy watching regularly anticipated games like anthem go down in flames, but people never learn their lesson with pre-orders. However rdr2 had gameplay previews and advance reviews that were hailing it as a smash and given how much time I’ve put into rockstars previous games, £33 on launch day was very low risk and I got my money’s worth several times over. In your scenario you’re still likely down as people weren’t buying rdr2 for £33 physical copies at launch. The money I’ve saved in digital games vs launch price through various methods more than offsets the depreciation loss by the time I could have sold it on, and I have the game forever. Can't see that happening, IF it did i think they'd make a huge loss on the console itself. Also i like having physical, i can trade in when i want, knowing at least i can get some of the cost back. Also i'm a sucker for a collectors edition, wouldn't quite be the same with an e-code in the box. £129, considering the cost of controllers, it will be a good little box. Ill stick with my xbox one x with a disc reader. Once finished with a game i buy on disc for a reasonable price not £50-£65 i then trade it in to go towards my next game. This is an awful idea by microsoft imo and will be rubbish for game shops and supermarkets who sell discs! The cross purchasing method has been blocked - damn it!